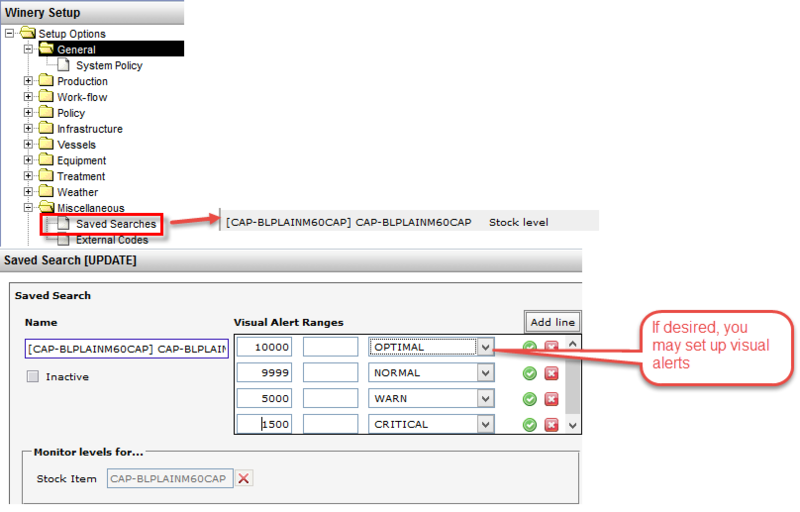 Once you have created a stock item, you’ll need to be able find it for future activities/operations. The Stock item overview is fast and easy to use, with a limited number of filters that can narrow the number of items returned when you click the Search button. The Stock search screen on the right is a highly sophisticated search tool with many, many options for filtering all your physical inventory (except bulk wine). Keep in mind that if you select more than one filter, your search will return only those items that fit ALL the conditions you have set. If you have stock levels for one or more inventory items that you need to monitor on a regular basis, from the Stock search screen, you have the ability to save your searches and have it appear in the My Searches dashlet on the main screen. Find your stock item; go to the Stock overview screen. Click Actions – Track on my searches dashlet. 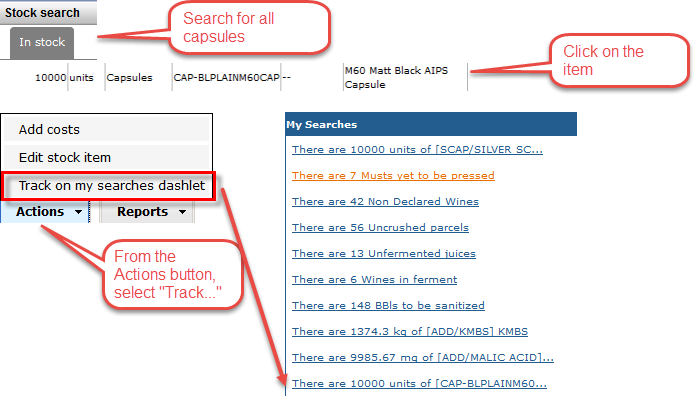 If you wish to change the saved search name, or more commonly, add visual warnings for stock levels, head into Winery Setup – Miscellaneous – Saved Searches. Find and select the saved search you want to edit. When the Saved Search set up screen opens, insert your various levels of warnings and Save. Notice that our stock levels for the capsule that you are tracking is now orange; the color will continue to change as stock levels increase/decrease.